To fill the empty space left by the Star Trek Discovery hiatus, I’ve decided to look at some classic Trek episodes that I feel are pertinent to Discovery. There will be spoilers but given the age of the episodes I won’t normally give warnings. First up is Errand of Mercy from the very first season of Star Trek. I must have seen this episode as a kid but when I saw it again as an adult I fell for the surprise twist hook, line and sinker. The obvious pretext for including this episode as background for Discovery is that it is the first Klingon episode. Like Discovery, Starfleet finds itself rapidly falling into war with the Klingons. However, my main reason for picking on it is as an example of what Discovery is failing to do, which is to examine some of the assumptions of Star Trek that arise out of its post-WW2 and US hegemonic roots. I’m reminded of well of the danger of assuming that what we remember of Star Trek is shaped by later series and the movies. In one of the Feminist Frequency recaps of Star Trek Discovery there was an extended critique of the episode when the crew of Discovery land on the planet Pavoh only to discover it has intelligent life. The critique was how Star Trek in general always treats it as a given that the Federation is good and that other planets and cultures should side with it over, say, the Klingons. I think that criticism is fair but, at the same time, Star Trek actually very cleverly pulled that whole concept apart way back in the very first series. We begin on board the Enterprise. Kirk has a message from command telling him that negotians are breaking down with the Klingons and war may be imminent. Kirk is told to proceed to the planet Organia – which is in a strategic position and may be targetted by the Klingons. Before the Enterprise reaches the planet it is attacked by a Klingon ship – which signals that the Federation is now at war with the Klingons. Kirk and Spock beam down to the planet, leaving Sulu in charge of the Enterprise with strict others to skedaddle if the Klingon fleet turns up. Kirk and Spock find the Organians to be a technologically primitive people, with little in the way of government. The Organians lsiten politely to Kirk’s offer of Federation membership and help against the Klingons but they politely decline. Shortly thereafter the Klingon fleet arrives and invades Organia. For most of the episode Kirk makes a series of speeches at the Organians. Initially he tries to scare them with the dangers of a Klingon invasion. Next he tries to tempt them with the colonial wonders of Federation technology. Later he lambasts them for their cowardice. The script plays this straight, with Kirk very much in character and the tone placing Kirk in the right and the Organians look like naive simpletons. (I don’t think the non-interference Prime Directive was in play yet but the underlying idea does get addressed later on). But one Trek trope is still in play – no alien planet is ever quite what it seems. There are clues – e.g. one member of the council of elders (all men by the way) is surprisingly knowledgeable about the deployment of Klingon starships in orbit. Also, and I’m sure this must have been deliberate, the door to the council chambers appears to work automatically, swinging open without being pushed. The normally observant Spock doesn’t comment on the door but I can’t imagine why the set designers would have gone to the trouble of a having a door swing open by itself for no reason. As the episode continues, Spock and Kirk battle Kor and his Klingons in various ways and both Kirk and Kor get increasingly frustrated and contemptuous of the pacifist Organians and their sad smiles. Kirk is also very much characterized as a military commander with a martial reputation that even Kor is aware of. Then the episode turns on its head. The Organians simply cannot stand the conflict anymore. Having repeatedly assured Kirk that they were in no danger from the Klingons they finally reveal WHY. Rather than technologically backward peasants, they are actually hyper-evolved energy being just cosplaying as peasants. They psychically prevent Kirk and Kor using their weapons, then they disable the Enterprise and the Klingon fleet and THEN project their minds to Earth and the Klingon homeworld stopping the war completely. Kor and Kirk are outraged. Kirk vehemently objects to the Organians using their advanced powers in this way. They explain how they prefer not to interfere in the affairs of lesser being but essentially the Klingons and the Federation had just become too annoying. Finally they explain that one day Humans and Klingons will be allies. Kirk, thoroughly embarrassed, concedes that they won’t be having a war today after all. The benevolent and patronizing colonialism of the federation, the assumptions of the necessity of war in the face of aggression and the assumptions about some cultures being backward are all aired unironically in the episode and then demolished – although with something of a Deus ex machina but it is played so straight that if you only saw a half of the episode you wouldn’t spot that the script doesn’t actually endorse what Kirk says. Not a flawless episode and at times accidentally comedic and oh-dear the Klingon make-up and facial hair is so very very awful but…also an episode which happily challenges the show’s and the audience’s own assumptions. My theory about Klingons and their changed appearance from the original series to The Next Generation is that for some political reason, the doorways in Klingon ships are always three or four inches too low. I never noticed that about the door…. One thing I always did notice was the way the initial beam-down is handled; when Kirk and his party beam in, the frame appears to be filled with a completely deserted town; it’s only once they arrive that extras in peasant garb start wandering across the screen. Now, obviously, this was at least partly due to the fact that visual effects tech at the time wasn’t up to the job of compositing the beam-down effect onto a scene with complex moving figures in it… but the obvious staginess of this one contrasts sharply with somewhat more naturalistic direction (e.g. the episode “Friday’s Child”, where the camera tracks a couple of native Capellans wandering across the shot, then stays still until they’re off the screen, at which point the landing party shimmers in.) Is this, perhaps, deliberate staginess – has some disembodied Organian voice said “OK, the humanoids are here, cue the peasants!”, rather than the director? I might add that, despite the boot polish, I always preferred the TOS Klingons to any other versions – they were clearly a bunch of aliens who were Just Like Us in all the important things, albeit working with a different political system. TNG and later Klingons are very much escapees from the Planet of the Hats, and I think, overall, they lose by it. I hadn’t noticed that about when they beam down – I hope it was deliberate because it is quite a clever episode. Yup, this is one of the original series episodes Discovery ripped off wholesale for episode 8 a.k.a. the one with the Latin title (The other is “This Side of Paradise”). However, IMO “Errand of Mercy” handles its subject matter better than the Discovery episode. And while the Organians are a plot device, they at least don’t fall into a plot hole like the Pahvans who are completely forgotten, once the Discovery finds something more interesting to do than protect them. It also helps that we see Kirk trying to convince the Organians who politely brush him off, whereas in the Discovery episode, we’re not actually witness to any of the conversations of the Pahvans, we only hear them reported after the fact by Saru or Michael. Never mind that energy beings disguised as low tech peasants are a lot more interesting (and offer a nice bit of misdirection) than energy beings disguised as glowy blue sparkles. My (and I suspect most people’s) image of the Klingons is dominated by the way they were portrayed in the movies and in TNG, Voyager and DS9. So it’s easy to forget that they once were little more than black face dudes with bushy eyebrows and really bad haircuts who functioned as a stand-in for POC military dictatorships. Though I still prefer the generic aggressive military dictatorship Klingons of the original series to Discovery’s orc Klingons with their knock-off H.R. Giger look. Coincidentally, the Klingon head honcho in “Errand of Mercy” was played by John Colicos who would later portray the villainous Lord Baltar in the original Battlestar Galactica. AH! I knew I recognized him from something. He is really campy fun as the bad guy but so utterly unlike future Klingons in character as to be quite remarkable. In Discovery it is implied there are vastly different tribes of Klingons, so I choose to imagine he’s from the Witty Urbane Villain tribe of Klingon where they all worship the work of James Mason in its original Klingon. YES, one of my Favorite original Treks for the audacity (doubly so for the sixties!) of having Kirk get it WRONG and feeling appropriately sheepish about it. And Colicos was a treasure. A delightful Shakespearean who could knock out of the park any multisyllabic line you gave him. I had the pleasure & privilege of writing for him (and meeting him) on a show I did in the early 90s; I was told just BEFORE I wrote the script that “hey, we can get John Colicos for the baddie, does that work for you?”… “1000x YES,” said I, and I had that rare but marvelous experience of being able to tailor the dialog to the actor and “hearing” it in his wonderful voice as I wrote it. Working with John Colicos must have been an amazing experience. I want a GPS with his voice insinuating what direction I should go. Mind you I don’t have a car so it might not be that useful. And given how little continuity there was in TOS by comparison to later Trek series, it’s impressive that they stuck to the status quo at the end of “Errand of Mercy” — when we see Klingons again, it’s under Cold War conditions. “The Trouble with Tribbles” even specifically refers to the Organian Peace Treaty and uses provisions of it to set the plot in motion. Forgive me for blathering on at such length, but I don’t get much chance these days to use all the TOS trivia I learned over 40 years ago and which now takes up space in my head that might otherwise have held onto chemistry or Asian history or something useless like that. The last time I caught “Tribbles,” it was still very funny. Hope you find the same. It’s more enjoyable if you imagine Roger C. Carmel as Mudd in the role of Cyrano Jones while you’re watching it. Well I’d mis-remembered it as having Mudd in it. I must confess that between my last comment I just went and re-watched it anyway and it really is still a big barrel of fun. It’s reputation is well deserved. I still found “Tribbles” excellent as well the last time I watched it. Definitely one of the highlights of the original series. Ford’s Klingons were so much better than anything that has been done with them since. Ah yes, The Enterprise Incident. That’s another good one. Plus, Spock 🖖 nerve pinches Kirk and does not end up in prison. Yes, what Inconstantreader said. 60’s current events are essential for really understanding TOS. Tribbles was funny last time I saw it. I can’t tell from the description, but I have an El Santo movie on VHS, purchased from the basement of the Denver Woolworth’s (which was three or floor tall and went all the way from 15th Street to 16th). The basement was where they had aerosol cans of Good Luck Spray, and lenticular pictures of Suffering Jesus on the Cross, and that day, they had a bin full of Spanish-language videos. The Woody Woodpecker one was tempting, but I bought a Buñuel movie, El Santo, and… something else, probably. It was 25 years ago. Maybe Aztec Mummy. But the one I really liked was Santo going down this damn river endlessly on one of those fan boats they go around the Everglades in, bear-chested, sweating profusely, and always wearing the damn mask. Also in the movie was a pair of twins, played by the same very developed actress. One of them was all good and stuff, wearing white furry angelic kind of garb, and so dull I don’t remember much of what she did. I don’t think the producers were very interested in her either. The evil twin wore black, and did these character-establishing evil hoochy koochy dances, and turned into things like a huge snake, a snarling jungle cat, and a squatty little hulk of a guy with weirdly spaced tufts of hair on his shirtless body. Yeah, I should pull that out again, and maybe THE BRAINIAC. 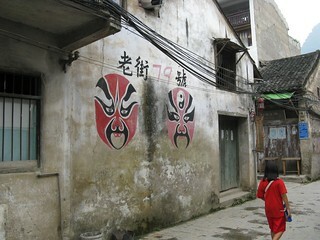 I felt like I was seeing Santo again in Guilin, wandering around the streets or alleys of one town, when I looked up and saw Figure 1, linked below. Not sure if it will show up here as a link or what (if anything!). “Son of El Santo vs Bureaucrats” is a film that exists. Clearly I’m not getting any sleep tonight.